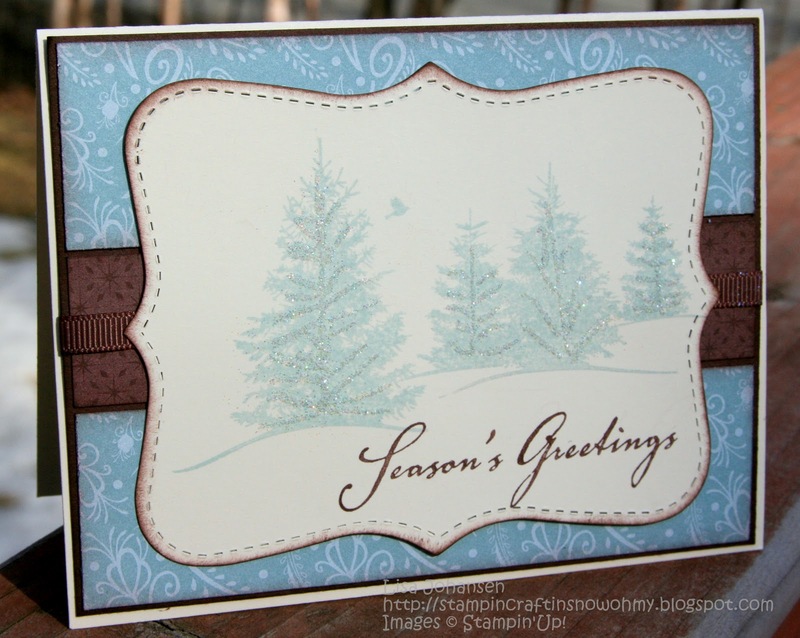 This card was meant to convey a lot of emotion to my step mom, as we had just lost my dad to cancer in Oct.2010. 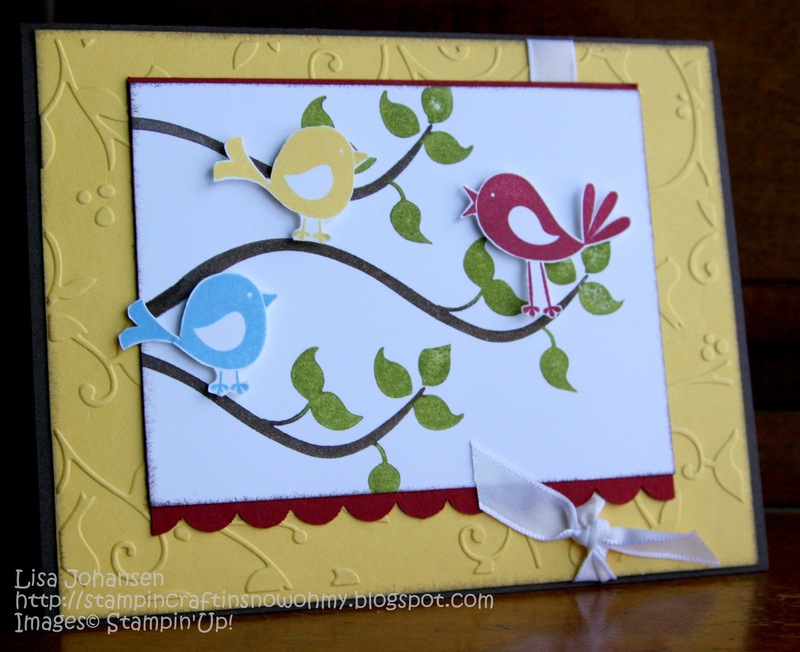 I love the bright cheery colors I used and the birds make me smile. My step mom loves birds, as do I, so I knew this card would bring a smile to her face also. 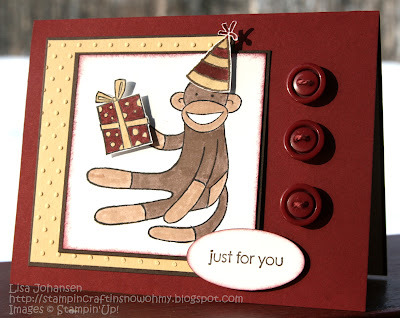 I love the color combo on this card and while I know a lot of folks don't care for this sock monkey stamp I get a big kick out of him. A nice CAS card. Yep, a Christmas card! I remember I wasn't too sure about the sketch when I saw it, but in my opinion this card turned out very fun. Yes, its another Christmas card. 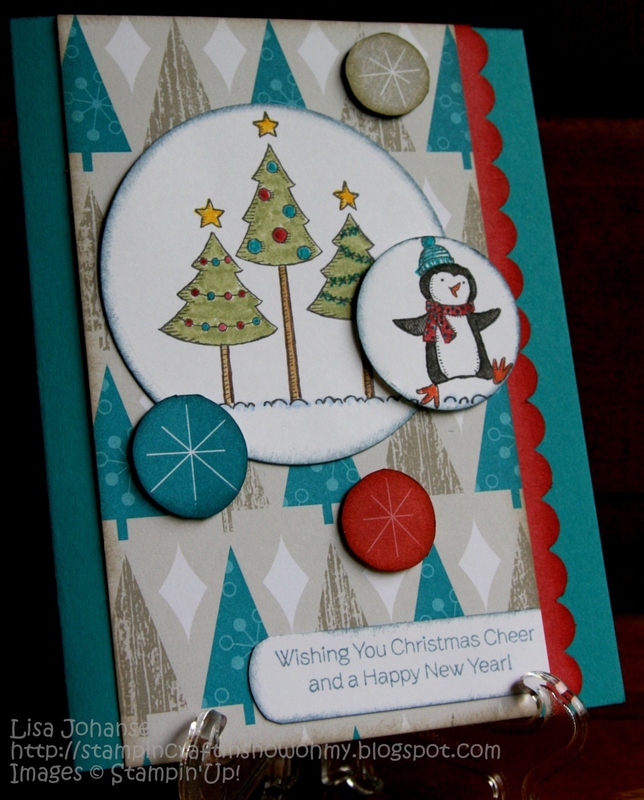 I adore Christmas cards and make them all year long, what can I say. This is one of my favorite stamp sets(I just used it to make a New Years card!). 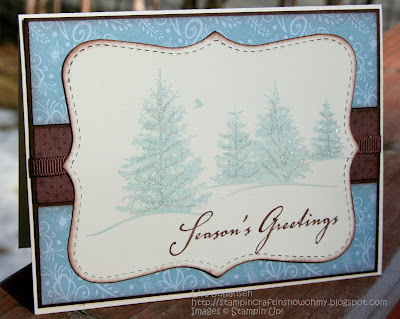 For me its the combo of the colors and the serene scene that just makes me love this card. If there was ever a card I made that screamed "THIS IS TOTALLY LISA" then this card is it. 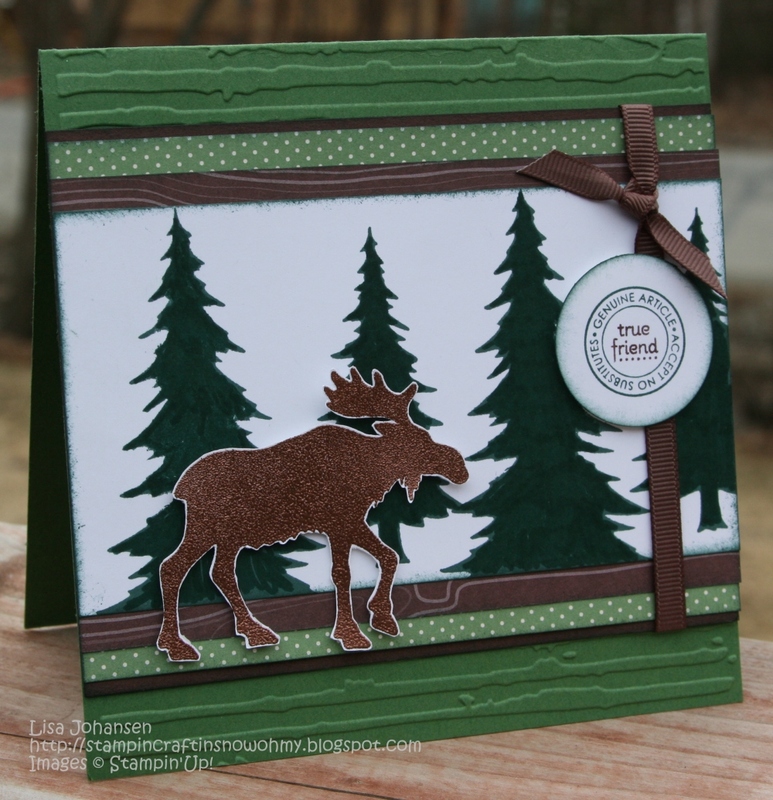 Moose, green, outdoorsy....yep, this card is totally me! Ok, I can hear you groaning, but I am choosing another Christmas card. 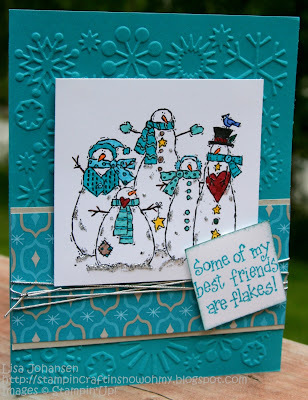 I love snowmen, I love the colors I used...I just love this card! Dang it, I cant help myself. 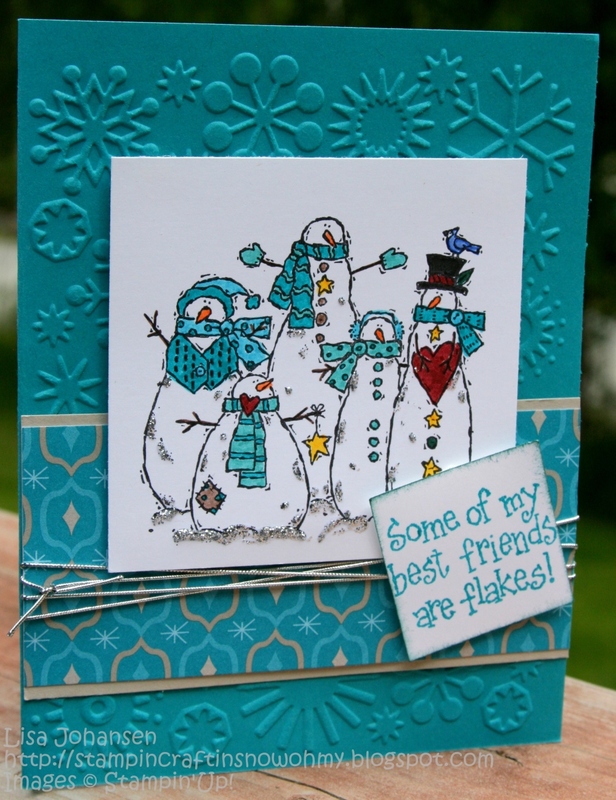 I adore penguins and I think this card came out super-fun and super-cute! This is a card I made for a Friday Mashup challenge. 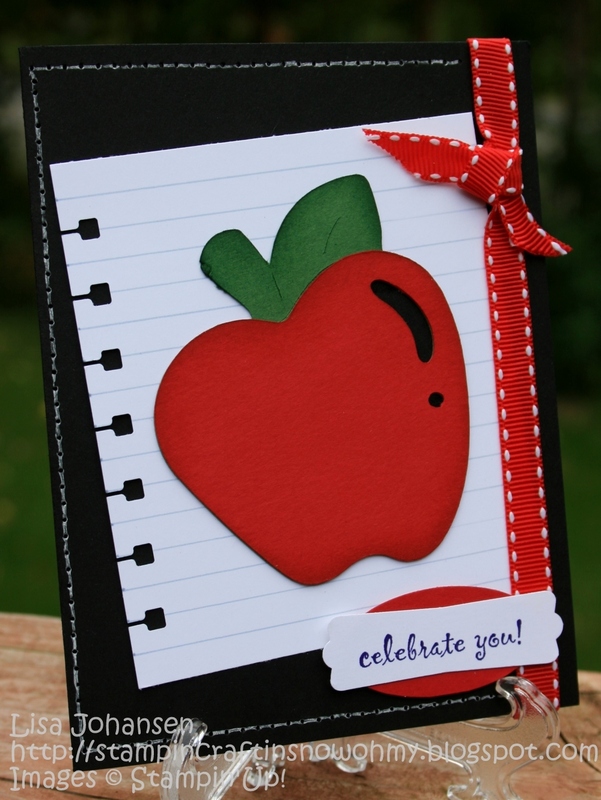 This card was so easy to make, between using the Cricut and SU products, and I was really pleased with how it came out. I made this card for Pink Week, and it was for my step mom, who is a breast cancer survivor. 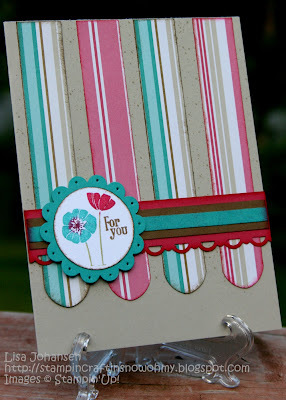 I like it because I went out of my comfort zone for it...I am not a fan of pink or "girly" looking cards, so when I do a card with those themes and it comes out nice I am pretty surprised, and happy! I love the DSP, the colors, everything. I think it might be my favorite card of the entire year. Since its December its safe to pick a Christmas card ;) I made my first real shaker card and I just love this little scene I created. Penguins, I just love them! I love them all, Lisa! I love Sock Monkey and am always glad to see another fan. :) I love the May card! I recently added two new stuffed animals to my moose collection; I'll have to take pictures. Happy New Year! Wow these are stunning you are so very talented. So nice to meet you just found your beautiful blog and so happy I did. I have enjoyed looking around and I'm now following you, if you find a spare minute hope you visit me sometime and follow back so nice to meet new friends. Sending you special wishes for a wonderful New Year I’m looking forward to keeping in touch in 2012.